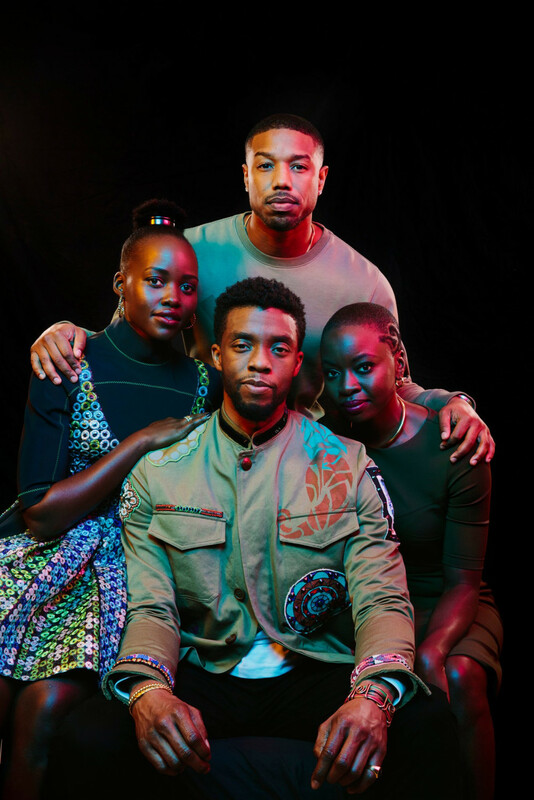 The director Ryan Coogler and the cast mates Chadwick Boseman, Michael B. Jordan, Lupita Nyong’o and Danai Gurira see personal and political potency in Marvel’s first black superhero film. They are featured in the New York Times, photographed by Brinson+Banks. 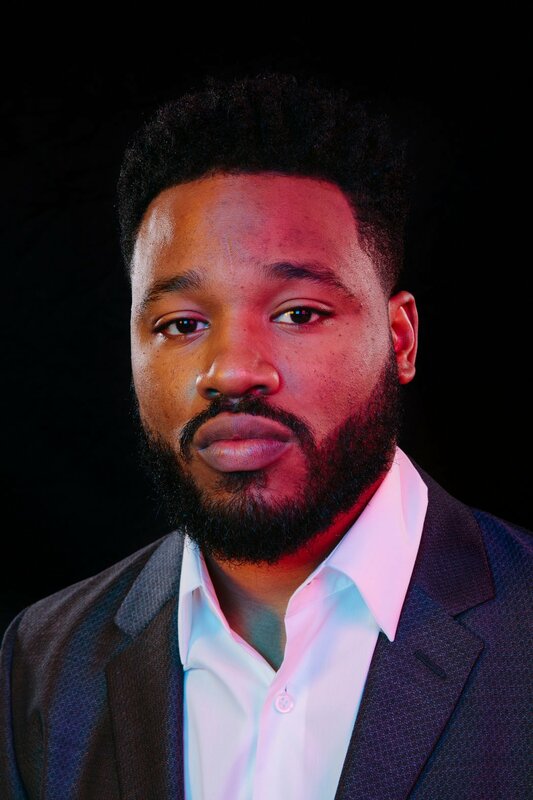 “Black Panther” is the first major superhero movie with an African protagonist; the first to star a majority black cast; and in Ryan Coogler (“Creed,” “Fruitvale Station”), the first to employ a black writer and director. 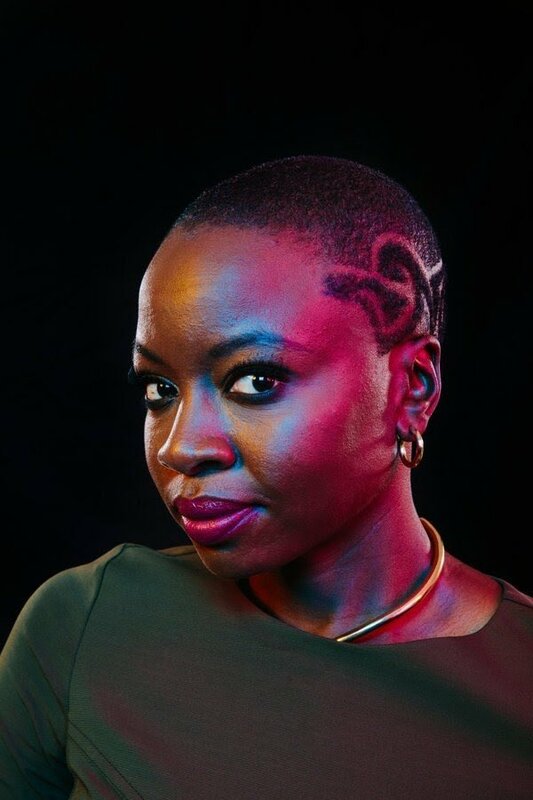 Danai Gurira on the large black cast: What it does in such a beautiful way, to me, is it sets a precedent. We’ve read a lot of subtitles for German and Russian — we can read subtitles for African languages now. People can’t go back and say, “No, that’s going to be too hard, it’s Africa.” They can’t do that. And that is so thrilling to me. 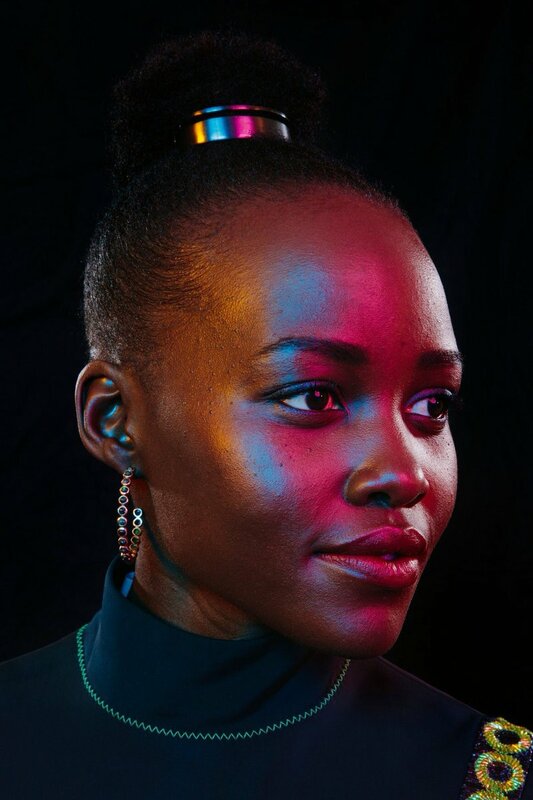 Lupita Nyong’o on what the movie means to her: Seeing it yesterday, I’m even more excited about the celebration of pan-Africanism, because this movie is really about a contemporary Africa relating very intimately with a contemporary America via the characters of Black Panther and Killmonger. We’re talking about some really deep issues that we don’t often voice but we all feel. 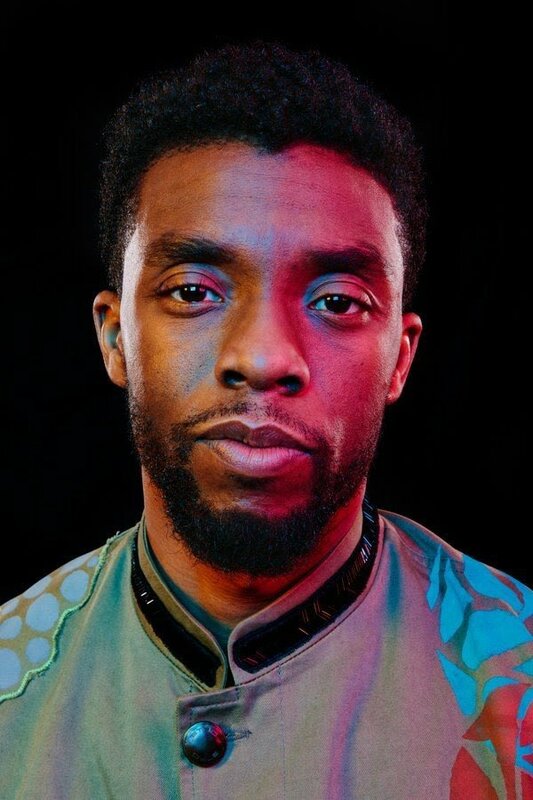 Chadwick Boseman on being cast in the movie: A lot of times, being [a black man] in Hollywood, when you get material you’ll read it and you’ll be like, “That’s not us.” When I got the initial call from Kevin Feige, my hope was that they would have the courage to give Black Panther its true essence and put somebody behind it that would have my same passion for what it could be. And they did that. 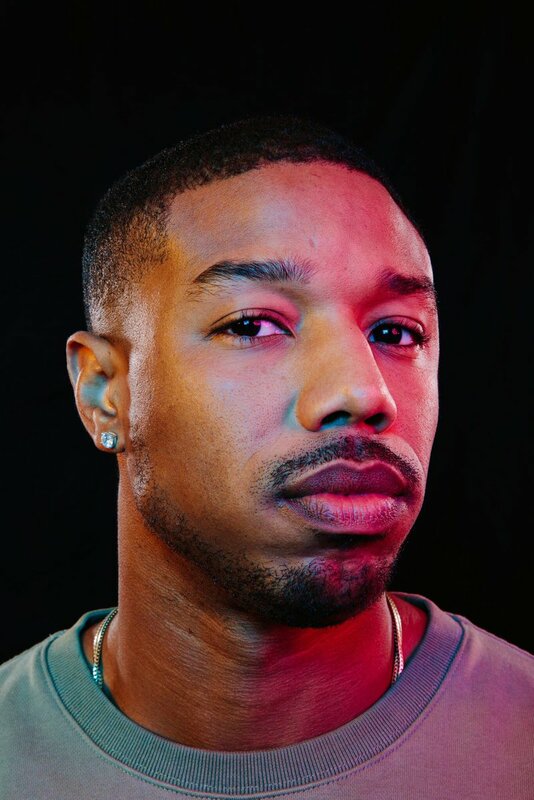 Michael B. Jordan on his character: Ryan [and I] started getting into the back story of where he came from and how his upbringing really affected his personality, his outlook, his rage, his agenda. We felt like we could show where Erik is coming from and make people feel why he is so angry, why he is so lost. He doesn’t know who he is, but he knows the answers are out there. Director Ryan Coogler on changing the narrative of Africa: The narrative about the continent that we know is actually a fairly recent narrative, if you think about human history. It’s a narrative that was born out of what happened when the countries of Africa were conquered. But the truth is that some of those places that people might refer to as backwaters — and these recent comments definitely aren’t the first time somebody has said something like that — were the cradle of civilization. They were the first places to do anything that we would consider to be civilized. All the structures that we built in Wakanda, they’re taller structures of what you’ll find in Africa. Some of them we switched up — instead of mud we used [the fictional supermetal] vibranium — but those are buildings that you’ll really find in Mali, in Ethiopia, in Nigeria. 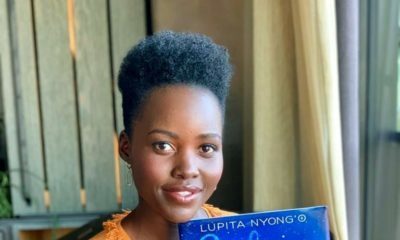 I spent about three weeks in Africa [doing research for “Black Panther”] and I truly felt that seeing it for myself was necessary for my growth as a human being. That experience made me not only capable [of writing] this film, but it made me whole as a person. 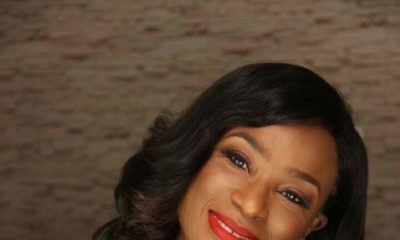 BellaNaija, how come you guys don’t give our Nigerian Celebs/Actors the kind of publicity you guys give to this Nupita… Everytime Nupita this Nupita that… Nawaoo! If una No promote our own people na Kenyan blog go promote them !! Your comment is so not true!! On this same Bellanaija that we see Nigerian music videos posted almost daily, an interview with Simi was posted only just yesterday and several others. Just say you don’t like Lupita and we will understand where you are coming from ehn. Oftentimes we see Africa as a place that is wanting. Amazingly the movie was not shot in Africa. Some of the scenes were recreated HD scenes done in studios. Wakanda is a fictional place that only exists in the minds of marvel. Maybe if the producers of this movie had actually shot some of the scenes in some locations in Africa then perhaps this conversation would make sense. I am all for Black panther but all these Africa stretching is just a bit much. Just keep promoting the movie.